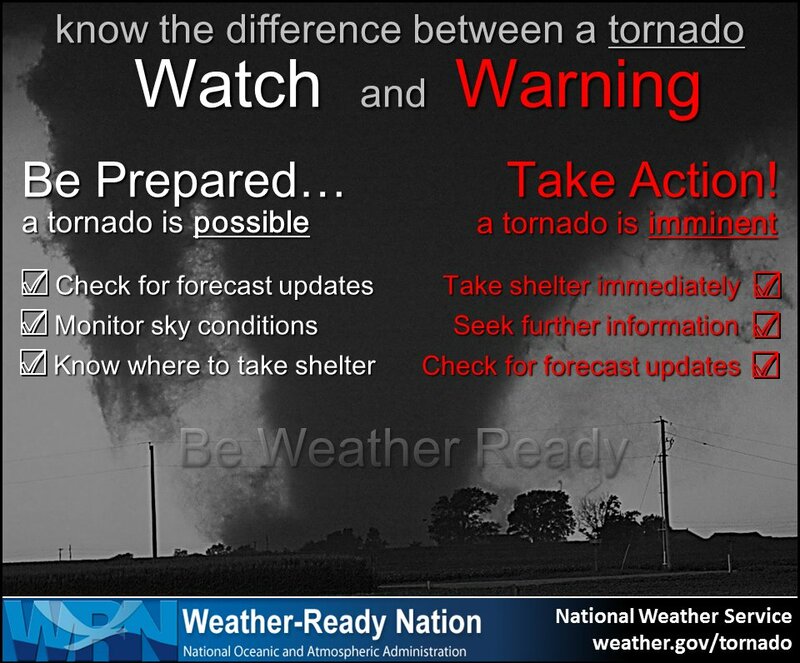 A Tornado Watch means Be Ready — conditions are favorable for a tornado. 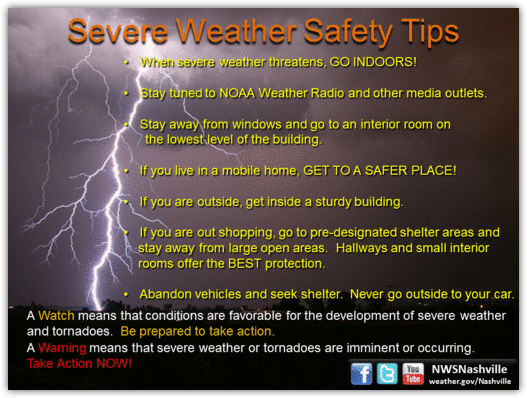 Be sure you can very quickly get to a safe place if a tornado warning is issued. Know where you are on a map so if a warning is issued, you know whether it applies to you. While under a Tornado Watch, those in mobile or manufactured home residents should closely track approaching storms and relocate to another, safer structure well before the storms arrive. If you wait for a Tornado Warning, you may not have time to relocate. Mobile and manufactured homes are particularly unsafe, even in more common, weak tornadoes. Identify a safe building well before severe weather strikes, and know where you can go morning, evening, holidays, at any time. Everyone should have a helmet. Adults too. Bike helmets, batting helmets, hockey helmets, whatever. Put helmets in your safe space. Close your garage door. Your house is more likely to collapse once tornado winds enter your garage. Charge your phone. You will need to access information if your power goes out, and/or to contact friends and family in the event a tornado strikes. Wear hard-soled shoes. Even if you have minor damage, there will be all sorts of hazards to your feet strewn about. You don’t want to be left barefoot. Essential food and medication should be in a backpack or otherwise secured on your person. Have your drivers license on you. That way, if your neighborhood is hit, you have proof of your address and can get back to your home. Have a whistle or air horn. That way, search and rescue can find you. A Tornado Warning means Take Cover Now — a tornado is imminent or occurring. Don’t go outside to see the tornado. Most of our tornadoes have very low cloud bases and obscured by rain. You won’t see it. We don’t have photogenic tornadoes like they do in the midwest or on Twister. Our storms also move very fast. Don’t waste time trying to see something you won’t be able to see. Tornado Warnings are issued by a team of meteorologists in a local National Weather Service office. Ours is in Nashville. Tornado Warnings have a start time and an end time, although they can and often are continued or reissued. If you’re in the red box (sometimes the box is purple), you are in the warning and should take cover. If you’re outside the red box, you’re not in the warning. In Davidson County (which is Nashville), the sirens go off in the entire county if any part of a Tornado Warning polygon is in any part of the County. (This is being fixed but the fix has not yet arrived). So, you may or may not actually be in the path of the warned storm if you are in Nashville and hear a siren. You should know where you are on the map and take cover if inside the polygon. Take cover in a site-built home or structure, in a small room on the lowest floor, putting as many walls between you and the outside as possible. You will survive the large majority of tornadoes by doing this. Do not try to drive away from a tornado. If you’re in a mobile home, you should hopefully already be out of it and in a safe place before the storm arrives. Wear your helmet. Serious injury to the head is common in a bad tornado. This is especially true for kids. The simple act of putting a helmet on them may save their life. Do not ignore a warning. The odds are the tornado will not strike you, and you will spend 30 or 45 minutes holed up with family and friends. That’s a tiny inconvenience that’s worth safeguarding and protecting you and your family from injury. Have a nice discussion. As always, follow multiple reliable sources for severe weather information. You can get us on Twitter @NashSevereWx (https://twitter.com/NashSevereWx). You should also watch your favorite local TV station (2, 4, 5, or 17). National providers like The Weather Channel and most forecast apps will not give you all the information you’ll need during a warning.